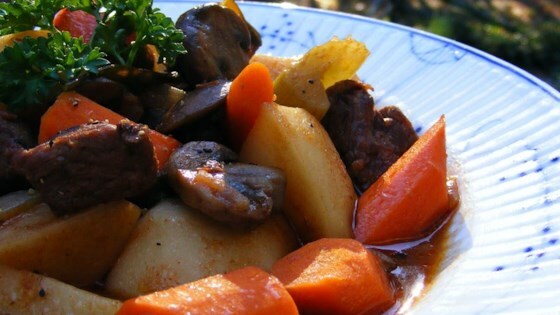 "Served with fresh bread and a salad, this hearty beef stew is a family favorite. It can be made fresh, browning the meat then tossing all the ingredients together in the slow cooker, or it can be prepared ahead of time for freezing and quick assembly for a quick crock pot meal when you need it! I like to make fresh stew, but double the ingredients and freeze the second portion for a quick dose of comfort food mid-week." Combine the flour, 1 teaspoon smoked paprika, seasoned salt, and 1/2 teaspoon black pepper in a large, resealable plastic bag. Add the beef, and seal the bag. Shake the bag thoroughly to coat the beef with seasoned flour. Heat the olive oil in a large skillet over medium-high heat. Shake the excess seasoning off the beef, then stir the beef into the hot skillet with the onion and mushrooms. Cook and stir until the beef is evenly browned and no longer pink. Drain and discard any excess grease. Place the beef mixture into a slow cooker. Place the potatoes, carrots, celery, garlic, Marsala wine, and Worcestershire sauce into the cooker with the beef mixture. Pour the beef broth and tomatoes into the cooker, and stir in the onion soup mix and 1 more teaspoon of smoked paprika. Cook on High for 4 to 6 hours, or on Low for 10 to 12 hours. Season to taste with salt and black pepper. For a thicker stew, combine cornstarch and water in a small bowl. Gradually stir the mixture into the stew until thickened. To freeze and make stew later, place the beef mixture into a freezer bag after Step 2, and freeze. Place potatoes, carrots, and celery into a separate freezer bag, and freeze. Mix together the garlic, Marsala wine, and Worcestershire sauce into a third small bag, and freeze. The day before you want to cook the stew, allow the three bags to thaw out in the refrigerator overnight, and place the contents of the 3 bags into the slow cooker. Then pour the beef broth and tomatoes into the cooker, and stir in the onion soup mix and smoked paprika as directed in Step 3. Finish cooking as directed in the instructions. This was OK. Even after adding the flour the gravy was too thin for us. And there just wasn't much taste. Won't be making this one again I am afraid. Yum yum...this was so great. I used regular paprika instead of spanish and it was still awesome. Thanks for submitting!